Lateral roots and root hairs are essential for water and nutrient uptake and their initiation and elongation is both developmentally programmed and environmentally responsive. Reactive oxygen species (ROS) are signaling molecules that regulate root development. ROS homeostasis is maintained by ROS scavenging antioxidants, which include flavonols. The DPBA probe becomes fluorescent upon binding to flavonols and revealed the distinct accumulate profiles of two flavonols, kaempferol and quercetin, in Arabidopsis roots. Flavonols accumulate in high concentrations in lateral root primordia, with kaempferol localized to dividing cells while quercetin is at lower levels with a more diffuse pattern. Flavonol concentration is also high at the root apex, where kaempferol is localized in the vasculature while quercetin is seen in the surrounding tissues. Interestingly, quercetin is lower in the epidermis, where root hairs originate. ROS is inversely proportion to flavonols, with higher levels in the epidermal tissues than internal cell layers, as visualized with the general ROS probe, H2DCFDA and H2O2-specifc probe, PeroxyOrange1. Using Arabidopsis mutants harboring defects in key biosynthetic enzymes to alter flavonol biosynthesis, we found that tt4 and tt7 mutants, which produce no flavonols or only kaempferol, respectively, have more root hairs than Col-0. In contrast, the omt1 mutant, which produces quercetin and kaempferol, but not isorhamnetin, has similar root hair numbers to Col-0. This result is consistent with quercetin as the active flavonol in the regulation of root hair formation. Both ROS probe signals are elevated in the tt4 mutant, consistent with the role of antioxidant function of flavonols in root hair development. Finally, chemical complementation with the flavonol precursor, naringenin, decreased root hair number in tt4 and Col-0 and reduced ROS accumulation. These results are consistent with flavonol-regulated root hair development by modulation of ROS levels. This work was supported by NSF IOS Grant 1558046. Gloria Muday is a Professor of Biology at Wake Forest University. Her research focuses on hormone and redox signaling in Arabidopsis thaliana and Solanum lycopersicum (tomato). Her laboratory studies the flavonoid biosynthetic pathways and how specific flavonol antioxidants control plant development by scavenging reactive oxygen species. The role of specific flavonols in controlling root development and gravity response, guard cell signaling, and pollen viability is being examined using Arabidopsis and tomato plants with mutations in genes encoding pathway intermediates. The localized accumulation of flavonols and reactive oxygen species is being examined by confocal microscopy. The Muday laboratory is also examining the transcriptional networks that control root developmental changes mediated by auxin and ethylene. Gloria Muday is Director for the Center for Molecular Signaling and Coordinator of the interdisciplinary major in Biochemistry and Molecular Biology. Bio: Gloria Muday is a Professor of Biology at Wake Forest University. Her research focuses on hormone and redox signaling in Arabidopsis thaliana and Solanum lycopersicum (tomato). Her laboratory studies the flavonoid biosynthetic pathways and how specific flavonol antioxidants control plant development by scavenging reactive oxygen species. The role of specific flavonols in controlling root development and gravity response, guard cell signaling, and pollen viability is being examined using Arabidopsis and tomato plants with mutations in genes encoding pathway intermediates. The localized accumulation of flavonols and reactive oxygen species is being examined by confocal microscopy. The Muday laboratory is also examining the transcriptional networks that control root developmental changes mediated by auxin and ethylene. 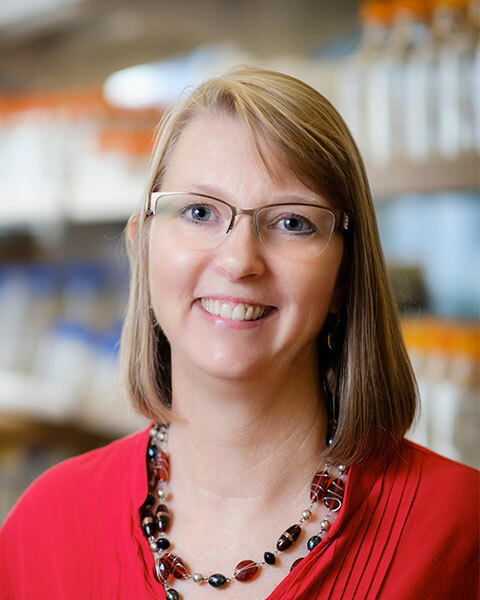 Gloria Muday is Director for the Center for Molecular Signaling and Coordinator of the interdisciplinary major in Biochemistry and Molecular Biology.